Marsha Bemko has been with PBS’s “Antiques Roadshow” for more than 10 years, the last six or so as its executive producer (see our separate Roadshow coverage). Though not a collector herself, her close work with some of the most knowledgeable appraisers in the country has given her a discerning eye for important pieces and a keen ear for a good story. Her latest book, “Antiques Roadshow Behind the Scenes: An Insider’s Guide to PBS’s #1 Weekly Show,” has just been published by Touchstone. 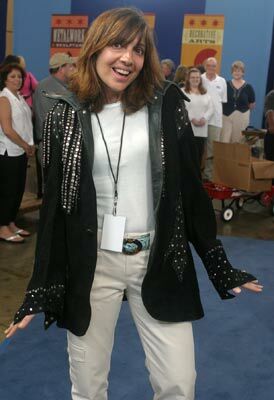 Marsha Bemko, executive producer of “Antiques Roadshow,” models an Elvis jacket brought to one of the show’s recent stops. I grew up in a suburb of Boston called Needham, Massachusetts. Ironically, about 10 years ago, I moved back to the same suburb. When I was growing up, I didn’t have any particular exposure to antiques or collecting, but when I went off to college in western Massachusetts and needed things for my first apartment, I started hunting antique shops. Ever since college, unless it’s a bed or something like that, if I need a good piece of furniture, I start old. In the beginning, it was just a matter of economy. And then it became, “I don’t want the brand new.” Of course, old things can cost a lot more than new things when you finally begin to learn your way around, but I was always interested in the flavor of old things. I was just in London last week—talk about old places—walking across the cobblestones at the Naval College, where I was watching a taping of the BBC’s “Antiques Roadshow.” Some of those cobblestones have probably been there since 1700. And I wondered, who walked down these cobblestones and what they were talking about while they were walking on them? I imagine that stuff when I buy an old piece. I wonder about the couple that first bought it, what it was like when they first got married, and I start to make up a little story. I’m a storyteller. I like to imagine the questions a piece brings with it. That’s what we do on “Antiques Roadshow”—you’re entering the past through the present. My interest in television actually started in high school, when I’d make up little plays and stories with a girlfriend—she’s in the film business today. In college, I wanted to major in communications journalism, but they didn’t offer it way back in those dark days. So I was an English major with a communications-journalism minor. We had a good professor who knew a lot about television. He said my Boston accent would never cut it on air. What can I say? It’s much better than it used to be when I was younger because I’ve been married to somebody who didn’t grow up in the city. But I never wanted to be on the air anyway. I always liked the idea of being the creator, the person who got to make the decisions. So, after college, I came to WGBH, my first job in television. That was 1979. I was making $7,000 a year as a clerk typist, and I was thrilled to have that job. I’ve always liked working here. It’s always been a nice place to work. I was very young and I didn’t realize what a nice place it was until I left and worked in other places. But it is nonprofit, and there are some downsides to that. We don’t get big, fat bonuses here: it’s about the work, it’s about the things we’re doing to make the world a better place. Before long they had more than doubled my salary to $15,000, and then they moved my job to New York. They said, “We’re going to give you another $3,000,” and I said, “I may be young but I’m not dumb. That’s not enough money to live in New York.” So I said no. I moved out to California because if you’re in television or film, you’ve got to do a stint in L.A. I think you’ve got to get a good taste of what that kind of television is. Probably it was a great career move. When I moved to L.A., I worked the whole time I was there because I knew film from the job at WGBH. And I still know a lot about film. It’s something you learn and you don’t ever forget. Collectors Weekly: When you returned to WGBH to work on “FRONTLINE,” was “Roadshow” already going at that point? Bemko: No. Their first taping season was 1996, and I was doing “FRONTLINE” in the early ’80s. So it was a good 10-plus years before “Roadshow” was a twinkle in PBS’s eyes. I was at “FRONTLINE” for six years. I was there through the birth of both of my children. I am a mother who has had a demanding career, and I have wonderful children. So this can be done. You can have children, you can have a husband, and you can have a demanding career and be happy. “Roadshow” was actually a spinoff of the British show. Peter S. McGhee, who is now retired, was the vice president of national programming here. That job required international travel. When he would go to England, his favorite show there was “Antiques Roadshow.” They’ve been around for 32 years. We just finished taping our 14th season, so they’re way ahead of us. 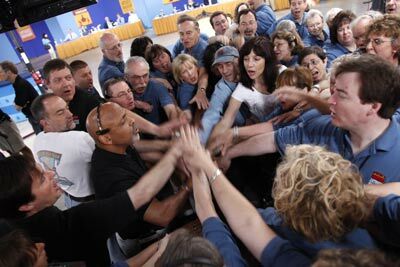 Before the doors open to the public, the “Roadshow” crew and local public-television station volunteers have a pre-show huddle. Peter said, “We got to do this.” He sent Aida Moreno, who was “Roadshow’s” first executive producer, over to England just to watch the BBC do the show and see how she felt about it. She came back and said, “We can do it but we need to do it different and we can do it more efficiently.” And so she was the executive producer for the first four years. At first, PBS didn’t want to air it in primetime. They wanted to put it in daytime with the other lifestyle shows on Saturday. But Peter knew better, and he pushed hard for a primetime spot. Public television has something known as common carriage, which happens on Monday, Tuesday, and Wednesday nights for programs starting between 8:00 and 10:00, the primetime hours. Most stations with common carriage will air whatever the network runs during those time periods. Common carriage makes it much easier to attract sponsors, so it was a healthy reason for wanting to have it. But when “Roadshow” first aired, they didn’t give it common carriage. It started out on Thursday nights at 8:00. Even so, within weeks it was a huge hit. Those who were here for the first production season, for the tour, they tell the stories about calling their relatives, “Come on down. We need people.” There were no lines, no long days. And they made 13 stops, which was the first and last time that ever happened. Once the show started to air and production for season two came along, Monday nights were secured at 8:00 p.m., and we haven’t moved since. The show had made itself a star, and as I say about our popular appraisers, we don’t air them any more than we do the others. It’s the audience who makes them stars. Bemko: After “FRONTLINE,” I worked at an ad agency because it’s always healthy to try other things. But I didn’t like it. I tried it for a year, but there’s only so much you can say about the shape of a bottle. And you have to write copy about that stuff. After a while it gets really, really trying. And so I came back to public television and worked on a couple of national series, limited series that basically were six one-hour shows. You work on them for a couple of years and you make the six one-hours and they’re done. I was a senior producer on one and a coordinating producer on the other. Collectors Weekly: What were the shows? Bemko: The first one was called “Discovering Women” and I was coordinating producer on that, and the second one was called “Culture Shock” and I was the series producer on that. After “Culture Shock,” I started to look around for a job because that’s how it is in television—you finish a series and the job is over. Right away I started to work directly for Peter McGhee, and then I got a call from Aida, who was the executive producer for “Roadshow.” And she said, “Come work for us here at ‘Antiques Roadshow’. You can’t be happy working for Peter. There’s no production.” And she was right because I like the shooting and everything. I like all that. It gets in your blood. Well, to make a long story short, she convinced me to come here. I worked with her for three months, and then she left. The senior producer at the time was Peter Cook, and he became the executive producer. I worked for him for four years before taking this job, and I needed those four years, I really did. You need a couple years just to learn the antiques. Ten years ago, if somebody had said that Marilyn Monroe always signed her signature in red, I would have simply believed them. Now I know the right word is “usually.” There is rarely an antique to which the word “always” applies. That’s the kind of thing you learn by doing a lot of listening and fact checking. That’s a very simple example, but it helps illustrate the point that it takes a long time to hear that stuff. You really have to develop a muscle for it. I may not always know the answer, but I know when to ask the question. Collectors Weekly: How many people are on staff today? Bemko: Including myself, there are 15 of us, two of whom are part-time. Collectors Weekly: Who is the show’s target audience? Bemko: Of course, as a producer, you’re trying to reach everybody. On Monday nights at 8:00, we want every television set in America to be tuned to “Antiques Roadshow.” That’s what all producers want: Everything and everybody. In reality, we know that half of our audience is over 50 and we skew slightly female, probably 55-45. Not a huge amount but a little bit more female. The exciting thing is we have almost 10 million viewers a week. So with that amount of people watching us every week, with maybe half of them under 50, that gives us an audience of roughly half-a-million viewers under 18. Collectors Weekly: Aside from age and gender, are there other interesting things you’ve learned about your viewers? Bemko: That is the delicious part of the show. Collectors are a very passionate group of people, especially if they are in a very narrow area of collecting. They write to us. They may know more than our appraiser does about something they have been collecting forever. And so if they think we missed something, we hear from them. If there’s information that they’ve given us that we think our audience should know about, we add it to our website as an Update. Bemko and supervising producer Sam Farrell watch a guest being taped. About 85 segments, in which guests learn the value of their items, are taped in a single day. So we have collectors watching. We also have non collectors. The college students who intern with us say that they play certain kinds of games while they watch our show. Drinking games, things like that, guessing games, all kinds of games. So we have college kids. We know this from stories and we know this from our demographics. We know that people are watching so they can make sure they recognize a very plain-looking Navajo chief’s blanket when it’s in a yard sale. And we know we have people watching to make sure that they don’t put their rare Navajo blanket in a yard sale for 50 bucks. We have yet to hear from a viewer who says, “That Susan Frackelton pot that’s worth $17,000 that that lady bought for $15? I’m the one who sold it.” We’re waiting for that call. It’s never come. We don’t want you to be the person who makes that mistake. And we know people are watching for that reason. We also know people like to watch just to vicariously look at what other people have in their house. There is some of that going on. It’s a little peek inside the window. We have history enthusiasts who watch the show. If you watch a whole season of “Antiques Roadshow” and you don’t learn when the Civil War happened—because we’re seeing mostly American objects—then you don’t have the audio on. You weren’t watching. You have to learn when the Civil War happened by watching the show. You are going to learn something about the city we’re visiting, and you’re going to learn something about our great country. Collectors Weekly: In this age of shock-value reality TV, how can something that’s so “eat-your-peas, learn-about-history” be so successful? Bemko: I think it’s those private peeks into people’s attics, plus the fact that other than Mark Walberg, the people you see on screen are not television professionals. The on-screen talent do not shoot television for a living. Our appraisers don’t and our guests don’t. That’s everyman with a capital E out there. Our guests can bring two objects with them when they come to “Antiques Roadshow.” As appraiser Rafael Eledge likes to say, “You can be sure that the two things they bring are the two things they’d grab if their house were on fire, after they’ve saved their family.” They’re bringing something very precious and dear to them, and most of them are going to learn they don’t have anything of extreme value. Collectors Weekly: How many appraisal segments do you shoot, and how much does the personality of a guest determine whether you will use their segment? Bemko: Well, hopefully we’ve gotten it right when we’re doing the picks—we try to make sure the guest will be intelligible and that there’s not going to be a problem. As for segments, we shoot two different types of appraisals. We shoot about 55 multi-cams, plus another 30 or so single-camera appraisals. We use about 45 of the multi-cams but we also use many of the single cams. So if you lump them all together, out of the 85 we shoot, we’re probably using 55 to 60 per city. I make the cuts on Monday after we’re done shooting. We start editing right away. Things can change while we’re editing, but I lay out those three shows before we shoot the next city. We’re editing Raleigh now, and the cuts are hard to make. My process is to start by watching every frame of the multi-cams. I make notes, and I basically grade the appraisals. I’m very stingy with ‘A’s. I lay out the show so that if there are six pieces of the furniture, each show will get two. You’re not getting a show loaded down with six pieces of furniture and no paintings. 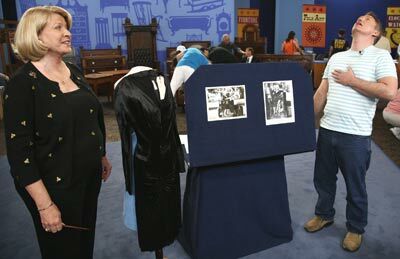 Every show needs a nice mix of objects, as well as a nice mix of dealers and auctioneers. Frankly, in this business there are more men than there are women, so we also make sure that there’s a nice mix of females on each show. And you can be sure that there is a nice mix of ‘A’s. What’s really hard, the most agonizing decision, is cutting something that isn’t actually terrible. Maybe two segments are competing with each other and one is just a bit better. So I have to cut some things that kill me. 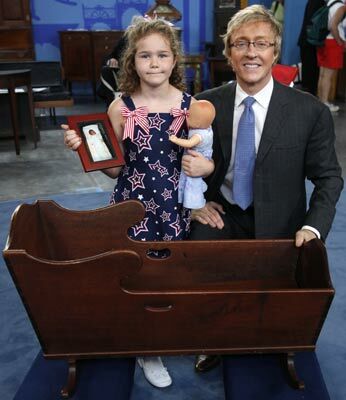 Furniture appraiser Leslie Keno with a young collector in Raleigh, North Carolina. The appraisers don’t know what’s running until a show airs, and for good reason. First of all, what if a segment has been potentially cut, and as we’re editing something happens and we need to use it? They’ll never know they were almost cut. The other reason is that I feel confident with those decisions, and no amount of begging is going to make me change my mind. Out of 150 or so appraisers we work with, I’ve made many friends. There are people I like immensely who I’ve worked with for more than 10 years. We’re friendly, but I will cut my friends. I have to be very unemotional about it because my responsibility is to make the best television possible—that’s what I’m paid to do and that’s the goal. My staff knows exactly what I mean when I say this, but the first year of making the cuts was the easiest because I didn’t know anybody. Knowing people and really liking them, and then cutting their stuff, is tough. It’s much harder on an independent paying his own way than somebody whose auction house is paying his expenses. But I don’t let any of those considerations figure into it. It is clear cut and based on the best footage, so we’re making the best hour of television we can. It can be a very painful thing to do. I think the hardest cut happened last year. I talk about this in the book. It’s the only time I’ve ever cried on a set. A man came over with a print and he told me that his wife had had the print and they had gotten tickets. His wife couldn’t wait to come, but she died before the show. He was there with his adult daughter. And then he stops talking, and his eyes are welling up. And I’m looking at him ready to ask the questions, and I’m thinking, oh, shoot, I’m going to cry. And I thought, okay, don’t talk and you won’t cry. Well, sure enough, I stood there silent. He stood there silent. We’re just looking at each other, and I didn’t bawl but I started to tear up. And meanwhile people are watching me, so he and I started to hug, and his adult daughter, we’re hugging, too. And people are running from their chairs, giving us Kleenex. It’s a scene. I’m telling you, it’s embarrassing for me. And I taped the object. But it wasn’t a great appraisal so I cut it, and that was the most painful cut I’ve ever made. I liked the guy immensely. I connected with him. He will have the distinction: I have never cried before or since with a guest. But I cut it. And you can be sure the appraiser thought it was in the bag because of the relationship I had built with him. But I don’t let relationships call those decisions. Collectors Weekly: How do you select the appraisers? Bemko: Most of our appraisers are returning, and many of them were here when I got here. But we’ve added quite a few new ones in the last 10 years. As a matter of fact, right now we’re looking for more watch appraisers. If you know anybody, let me know—it’s not so easy to find people who do watches. We start out by talking with the people we’re working with to see if they have recommendations. People send us e-mails, too, saying they want to be a “Roadshow” appraiser. We keep all those things on record. But we’re very loyal. We have a nice stable of furniture appraisers, so it’s going to be hard to break in there because we’re going to assign Mike Flanigan, Kenny Farmer, Leigh and Leslie Keno, and all of our regulars first. Collectors Weekly: Do they also have to be good on TV? Bemko: They do, and some are better than others. You probably have your judgments about which appraisers are better and so do we, and they’re probably a similar list of names. The fact is that in some of these areas of collecting, some of the people who really know what they’re doing are not necessarily the most bubbly people to be around. You compare the style of somebody like Wendell Garrett with a Stuart Whitehurst or Mike Flanigan. By far, Mike Flanigan is one of the best performers we have. He brings his own charm and passion to his appraisals. When appraisers watch a show and see they are not there, the good ones will call me and ask me why they were cut. Collectors Weekly: Do you coach them? Bemko: You bet I do. I will reach out to people when I see them and say, “By the way, you need to correct this particular thing.” It’s in my best interest that they’re successful. Most people are initially very uncertain in front of the camera. Then you have an exception like James Supp, a new guy who came to work with us this year. He is just a natural in front of the camera. Most new appraisers do better by taping their first-year appraisals with a single camera. They get less nervous. The multi-cam is a lot of eyes on you, and it seems to make things a little harder for those who are a little uneasy to begin with. So we like to let them warm up in front of that single camera, to do more there because there’s a better chance of it airing. Collectors Weekly: What are your favorite cities for the richest stuff and best stories? Bemko: It’s like picking a favorite child. It’s hard. The areas of the country where wealth congregates tend to reveal more valuable objects. For instance, in Palm Springs, California, we set a record on the number of six-figure objects taped—there were six. If you go to a place like North Dakota where there’s not a lot of wealth, you see fewer of the valuable pieces but you still see great things. On the set in Palm Springs, California, the crew gets ready for a segment. The black dress in the center was worn by Marilyn Monroe—photos to the left of the dress show it in action. I think that every city has its own personality. I liked Spokane because the people who originally settled there had moved to a very cold and dangerous part of the country. Today there’s a real feeling and spirit of community up there. I don’t think that’s an accident. I think it’s the culture that was built from the time that place was settled. In general, you see more regional objects when you are in that region. So, you will see lots of northwestern objects in the northwest. That said, there’s lots of Hawaiiana in Boston, and I think there was a woman in Honolulu who’d been related to somebody who started the Tate Gallery in London. Now one would not think you’d find all this valuable paperwork from the beginnings of the Tate in Honolulu, but there it was. You can be sure we see a lot of jewelry in Florida, but stuff has feet. Because we see 10,000 to 12,000 objects in every city, we see a lot of things that have traveled a long way. Collectors Weekly: What are some of the most significant changes in the collectibles field that you’ve seen during your time on the show? Bemko: The big one has been the Internet. When I started on this show, the Internet was not the player it is now. Somebody like Rudy Franchi could speak to this better than I, but take Disney animation cels as an example. There was a time when people thought they were rarer than they do today. The Internet revealed that there are a lot more cels out there than people suspected. They’re still valuable, but not as valuable as they used to be. So I think the fact that our collective knowledge is easily shared has changed the marketplace for certain items, and I have witnessed that. When online marketplaces like eBay first came along, people turned up their noses at them. Now you see very reputable high-end dealers partnering with them for their auctions. But the Internet has also brought more young people into the circle of collecting, which drives trends in antiques. I think the public is more informed now, and I think “Antiques Roadshow” deserves some of the credit for that. A few years ago, people had no idea that they could own a piece of furniture that could be worth five, six, maybe even seven figures. So when someone offered them a lot of money for their high chest, they took it. But it isn’t good money if someone pays you $20,000 for a $200,000 piece of furniture. I think it’s harder to get away with that now. Collectors Weekly: Some say collecting is generational, others say collecting is dying because young people would rather play video games. What do you think? Bemko: Who knows? But I think what happens is—and I’m saying this more as a mother than a producer—that people age into appreciating things that seemed less important when they were young. The fact is that if you let a piece of your family history go, you probably won’t be able to buy it back again. I think a lot of people make that mistake when they are young, but as they age, they don’t make it again. I know I made that mistake. Thirty years ago I sold things that I would never sell today. Collectors Weekly: How do you decide how hard to turn the tiller toward modern or vintage and away from older antiques? Bemko: That’s a really interesting way of putting the question. I often use our appraisers’ enthusiasm to guide our choices. For instance, Leigh Keno now sells modern furniture in addition to Federal and Victorian, but he didn’t use to. He loves George Nakashima now. I think it’s a response to the market and his taste going with the trends. A lot of what we see is the market guiding the appraisers in what’s hot and what isn’t. We also read the trades to stay close to the market so that I can challenge an appraiser. When they say something is really hot now, I can say, really? Collectors Weekly: How does the “Antiques Roadshow” website fit into the future of the show? During a recent taping, Bemko compared notes with associate producer Jill Giles (left). Bemko: We’ve got a lot of work to do. In addition to sending us your stories, which is a section on the site, you’ll soon be able to send them as videos. The web is how a lot of young people are ingesting their television. And frankly, if you don’t want to watch all of Raleigh, or if you just want to see all the Chinese objects that we’ve ever appraised, you can use our archive. We have a feature coming up that will allow you to create a playlist from the archive versus just organizing it. You can make your own Leigh Keno show. Go ahead because we won’t, I promise! In fact, part of what we’re doing is making sure you can have “Roadshow” your own way. If all you want to see is one three-minute appraisal, we’re okay with that. If that’s how you get introduced to the subject of history, collecting, antiques, your great country, then fine. Maybe you’ll be back. I figure it’s our publicist’s job to get them to the screen. It’s our job to keep them. So we need to make a show that engages you from the first frame to the last. We have a new thing coming this year at the very end of our show after the Feedback Booth called Hidden Treasures, which are little appraisals we couldn’t fit in the show. They’re for those who are like, “just give me prices, give me more prices, give me more, give me more.” So now, we’re actually giving you more. Collectors Weekly: So entertainment is also a part of the equation? Bemko: Absolutely. We’re here to entertain and inform. Ideally, you won’t even know you’re learning. We sneak it in. It’s like having hot chocolate with vitamins in it. I think that’s why people come back every week. It’s smart reality television. Bemko: The planning process happens internally here at WGBH. As a matter of fact, I’m preparing for a strategic-goals meeting now. That’s basically with the vice presidents at WGBH, but everybody feels like they own this show. I couldn’t stop our appraisers from giving me suggestions about what they think we should be doing if I wanted to. I welcome it, frankly. Collectors Weekly: I know you don’t collect, but if you did, what would it be? Bemko: If I collected, I think I might have to go with jewelry. I know it’s very, very cliché, and I didn’t feel like this years ago, but aging changes you. Collectors Weekly: What kind of jewelry? Bemko: I want things like diamonds. I know; it’s very bad. But I love the cushion cut and all that. And I love those Judith Leiber purses, the studded ones, love those. Any reader who wants to send me gobs of Judith Leiber purses and cushion-cut diamonds, I’m all for it. When I got married, I told my husband I didn’t want a diamond. He had to buy me one much, much later. Collectors Weekly: Can you tell us a bit about your book? What can we expect? Bemko: There’s a great deal of detail about the show, all the exciting parts. Things like the time Wyatt Earp came to “Antiques Roadshow” in Las Vegas. You’ve never seen that appraisal on TV because we’re journalists—it didn’t fact check out. But we can tell you the story in the book. We also talk about how we cleaned up our mistakes, our big booboo way back when. Good behind-the-scenes stuff. You’ll get to know our appraisers, what some of their passions are, what they’re looking for, what they hope to find, their missing masterpieces, which I think is very cool since most of them have been looking at things since they were children. As an appraiser who has worked on the show since 1998… I LOVED the interview! Marsha is a sweetheart and a VERY hard worker… I know from experience how hard it is for her to choose what to air, to tape etc…. Good questions….good responses….I actually learned a lot about the behind the scenes workings and thought processes. Thanks! ps. I have been an appraiser on the show since 1998. It was a pleasure to have learned such a lot about the American version of a long-time stalwart on British TV. This Martha Bemko is a real PEACH, and does indeed seem to deserve at least an occasional appearance in the spotlight. Brava Mrs. Bemko! Keep up your fine work and we shall stay tuned faithfully.